You should never leave flossing out of your oral care routine. #3. Flossing will save you money! Preventative care, like flossing, is a great way to keep your mouth healthy and avoid expensive trips to the dentist. Emergency dental care will cost you a lot more than regular checkups and a good oral care routine. If you are looking for the most effective and affordable dental care option, you should know that nothing beats preventative care. #4. 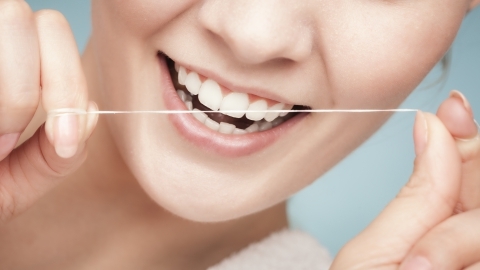 Flossing helps to keep you healthier overall. Gum disease not only leads to bad breath and discolored teeth, it can also affect your overall health. Research has shown that the bacteria in your mouth can actually get into your blood stream and lead to other health issues, like respiratory illnesses, diabetes and even heart disease. That’s why, in 2003 the CDC started calling for public health initiatives addressing the fact that oral health is a step towards preventing systemic diseases that are potentially life threatening. #5. Flossing helps to prevent the buildup of tartar. When plaque sits in your mouth for too long, it becomes tartar, which can also lead to gingivitis. Unfortunately, tartar can only be removed with professional help, but luckily, flossing helps to prevent the buildup of tartar.